On my Irish road trip, I saw a lot of impressive things – jagged mountains, green valleys and wild coastline. I also saw a lot of historic things – overgrown monastic ruins, abandoned farm houses and the ever present round tower. But the most impressive and historic sites were Newgrange, Knowth and Dowth, three Neolithic mound tombs along the Boyne River and a UNESCO World Heritage Site. Predating the Egyptian Pyramids, the mounds are passage tombs, meaning they contain one or more stone lined corridors where traces of human remains were found. 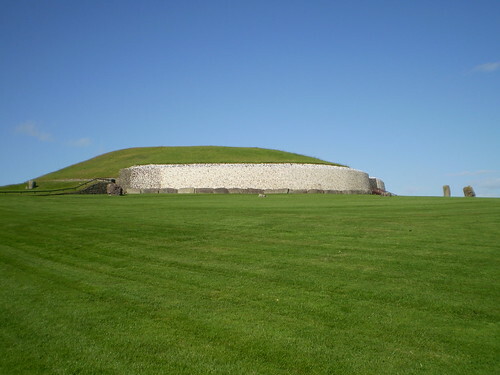 Newgrange is the largest and more famous of the three. It aligns such that on the winter solstice the sunrise illuminates the inner chamber in what must have been a highly potent spiritual moment for its prehistoric builders. You are allowed to enter the somewhat claustrophobic passage and view a chamber formed by an impressive corbelled ceiling. While it looks beautiful, the stone exterior of Newgrange is a reconstruction from archaeological guesswork. The white stone and river stone in the facade can be traced to sites quite a distance away. It is possible that the stones were brought as offerings and left outside the portal and therefore might never have been part of a collapsed stone wall as the restoration assumes. I am far more interested in prehistoric carvings and so I enjoyed Knowth a little more. 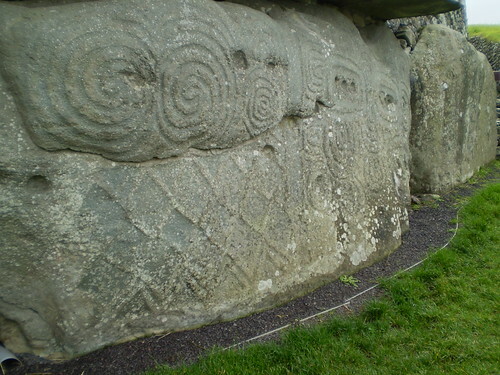 Both mounds are encircled with meter tall stones but those around Knowth are more extensively decorated. While it is easy to try an interpret the swirls (everlasting life? rebirth?) and organized dots (there’s 12 on one rock, is this a lunar year reference? ), I prefer to enjoy them for their design and to appreciate the ancient conviction that created these deep stone markings. 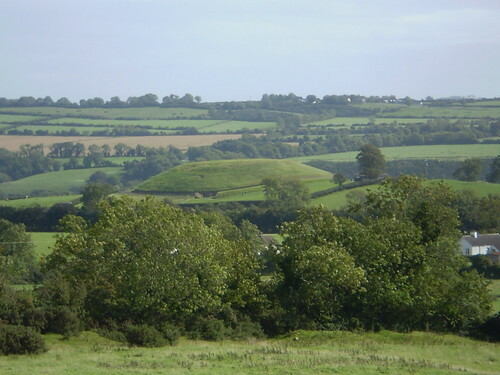 You cannot go far inside the Knowth passages but you can climb on top of the mound. The Knowth site was occupied by humans in later periods so in restoring the prehistoric site, archaeologists had to go down through the remains of a Cistercians farm, Norman dwelling and Bronze Age village. The sites are only accessible from the Visitor Center which runs timed tours of 15-20 people by shuttle bus to each tomb. You can choose just to see just one tomb but you are completely cheating yourself if you don’t visit both Newgrange and Knowth! (Dowth is closed for posterity with plans to excavate it someday.) During the obligatory wait before your tour time, the visitor center has a good video about Neolithic religious practices and some interesting exhibits. I really love that top photograph – ironically it looks like a contemporary eco-friendly art gallery! Maybe by Tadao Ando?! Interesting comparison. Since the reconstruction is recent and was based on limited historical data for recreation, I wonder if the modern influence was there in the back of their minds?